When we last posted a collection of before-and-after dog photos, we were overwhelmed by a flood of photos from our readers their own photos of dogs growing up. We love these photos as much as you guys do, so here's a new list of before-and-after dog photos for you guys to enjoy and add to! 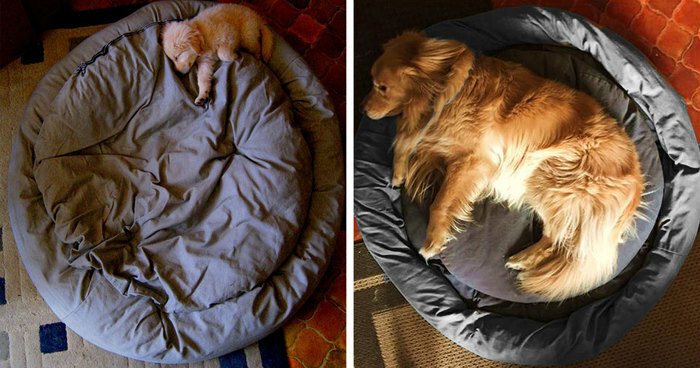 One thing you'll probably notice from these photos is that dogs grow REALLY fast! Depending on the size of your pup's breed, they can reach their full size in 6 to 18 months with some of the largest breeds sometimes taking up to 2 years. Feel free to add photos of your own pooch from their earliest puppyhood and how they look now. Write the time elapsed between the two photos too so that we know how much they've grown! Would love to know their names. They are such big lovable babies! Dogs eyes can change just like babies do. Most all babies are born with blue eyes then around 6-9 months their true eye color will show. Just a great big snuggler! The dog became obedient after 11 years and looked at the camera. Still very proud posture. Lovely! Love it. You know this is the same dog! Love that happy dog smile! The Goldens grow so fast! I swear he moved in between! Aww... What kind of dog is that? The owner is even more beautiful than the dog. My companion for 18 years was a wolf/malamute mix. Best puppy ever, I miss him every day! Awe.... how adorable, and Beans is a perfect name for him. What breed is this?? It looks just like my puppy I just rescued. A true cuddle bunny (or dog). And learned to keep his "stuff" nearby. So sweet. See, I still fit - well sort of. #55 Pepi And Simba. Three Years Apart. It Looks like ms dog! Wow, he grew into a very handsome dog! imho chihuahuas looks cuter when they're adult. This one is a character, I can tell!!! Cutie!! #65 Piper My Husky Puppy At 5 Weeks To 8months, Such As Big Difference. He looks like a muppet in the 2nd photo. Very cute pooch. #73 Jackson...it's Still My Bed...10 Wks. And 1 Yr. Still got the control of the TV remote! Way to go boy! #78 Smallest Baby Turns Into Biggest Lover! 1 Year Apart. Why does your dog want to eat human? ;-) Great pics! And he will love that crocodile when it is only a small piece of cloth, so don't throw that little scrap away. #81 2011 Barely As Big As My Shoe! 2015 Takes Up The Whole Bed In The Cabin At The Lake. #83 Astra. One Year Difference. #85 Charles Coal Black (charlie) 1 Year A Part!